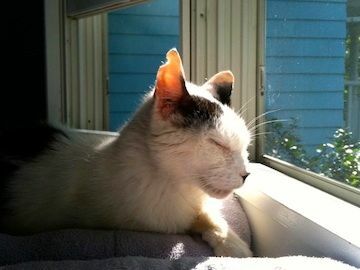 A wonderful rescue group called to ask if we would consider adopting a very sick, blind cat. He'd been found in bad shape. When his owner had died a while back, the cat had been put outside to survive on his own. He was FIV positive, had hyperthyroidism, and suffered from terribly infected mouth and eyes. We named this remarkable cat, who had somehow managed to stay alive despite so many threats to his survival, Huxley. When we adopted him, we had to admit him immediately to our local emergency hospital until they could stabilize him. Emergency dental surgery removed most of his teeth. The ophthalmologist removed one of his eyes, which was badly infected--was removed. Later he would lose his other eye because of infection. Huxley loved crawling up into one of the rocking chairs and shifting his weight to make it rock gently. At night, when things have quieted down, he would crawl up onto the bed and sleep by my head. Huxley was with us just short of two years. He died overnight in his sleep. He added so much to our home, and we are so thankful he came to be part of our family. He was a real joy to be around, purring loudly and nuzzling whenever you'd pet him.